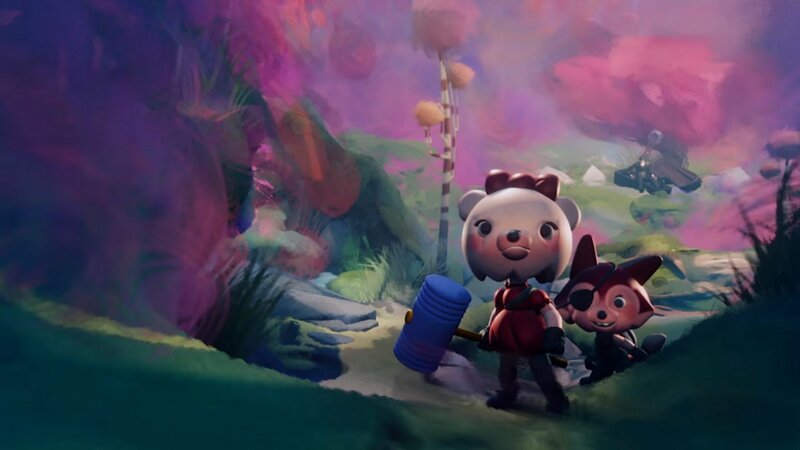 Dreams is one of the most fascinating games in development right now, offering users a staggering degree of creative freedom to design their own worlds and adventures for people to experience. The Dream ended recently, and with the release of the NDA for the software, hundreds of users have been posting their and other’s works online. From reproductions of classic titles to entirely unique and bizarre adventures, the Dreams beta has resulted in a plethora of fascinating creations for us to view. Collected below are some of our favorite creations from the Dreams beta. Easily our favorite creation to arise from the beta is this adorable story by Media Molecule’s own Peter Field. The premise comes from a recorded conversation with his four year old son, and tells the story of a small pea attempting to get burned in a pot. As children’s stories are wont to do, the plot careers wildly, with each detail brought to life by Peter in the game before coming to an abrupt end. Short and utterly adorable. Haus of Bevis is easily the most dreamlike creation on this list, inviting you to explore a surreal museum and marvel at its sculptures, artwork and sounds. Statues of bulbous, bloated figures stand proud on pedestals, while 2001: A Space Odyssey style monoliths cough up snippets of what sound like movie dialogue, each without context but teasing with an urge to learn more. The haus of Bevis is certainly a strange place, but one we thoroughly enjoyed visiting. Cubric is a fez-style puzzler that sees you attempting to escape a series of puzzle cubes by rotating them around your small stick figure. You can flip the cube to make a wall into the cloor, travel round corners and link up doorways, but things get progressibvely harder as you enter each new block. Walls of fire become bouncing traps to be avoided, and the keys to progress are hidden behind secret passageways. A great concept for a puzzler. Curiosity is a tiny Dream as creations go, but we couldn’t help but find the grey landscape evoke a haunting sense of atmosphere that few other creations lived up to. There’s not much to see or do here beyond the walk to the ending, but we hope the creator will put their skills to work on more when Dreams releases properly. Plenty of Dreams creators have spent their time recreating other gaming experiences, from the horror of PT and Dead Space to the lighthearted environments of Zelda. Our personal pick of the bunch is Se-mi92’s recreation of an old-school Tomb Raider game. Having grown up on Tomb Raiders 1 & 2, we can safely say that they nailed Lara’s running, sliding and pistol-drawing animations, providing an immediate hit of nostalgia. Better yet there are even puzzles to solve, meaning this is more than a simple visual nod to the past. Fancy a relaxing game of pool after all the excitement? The Dreams community has you covered there too. John Beech’s impressive pool game models the physics well and also included a full AI for the game to compete against. One of the coolest things about Dreams is that its community is finding uses for it outside of creating standalone games. Dreams & Dragons acts as a tabletop RPG assistant, letting you bring pen and paper encounters to live with small figures on a board capable of being flipped between different states such as charmed or unconscious. It might be a bit cutesy for more serious adventures, but makes for a solid companion to help players visualize an environment. Dreams & Dragons even includes an initiative tracker and dice rolling system. Countless excellent little platformers were put together during the Dreams beta, Shifting Island’s charming little protagonist may be out favorite. Building on a Mario-style premise, levels are built out of red and blue platforms, with each color alternating between tangibility whenever you jump. The best part of Shifting Islands however is the small shops you’ll reach to spend collectables at. Here you can deck the fuzzy ball of a character in different colors and outfits that had us giggling throughout. Much like platformers, many tried their hands at producing FPS games within Dreams, and while there were some impressive horror contenders like Visceral, Prometheus was perhaps the most complete.Though less time was spent on the visual side of things, Prometheus includes a range of weapons to play with and plenty of monstrous baddies to blast away at. We look forward to the full thing following Dreams’ release. All in all the Dreams beta has led to some wonderful works of art from its small community. Here at AllGamers we can't wait to see what the countless brilliant budding creators out there can produce in the full game when it launches later this year.